8th November Visit from Edinburgh P.S. 20th November Visit to Arbroath P.S. 21st February Visit to Aberdeen P.S. 14th March Visit from Perth P.S. 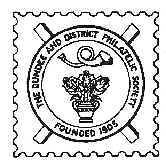 19th March Visit to Stirling & District P.S. 28th March Visit from Caledonian P.S.